Here are more stickers cards to inspire you to use those beautiful stickers that you can find almost everywhere. 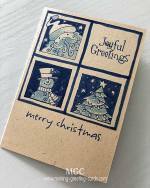 Stick them onto a card blank, write a personal note and make someone smile. Above are some of the stickers cards I have created. 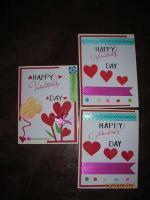 These are simple and quick cards that you can easily make especially if you are in a hurry. 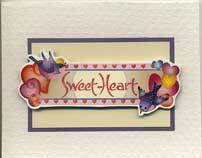 This can be used for a quick congratulation card for a wedding. 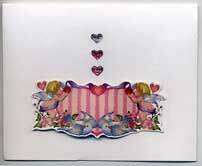 Here's a Valentine Card using just one sticker and layering it onto cream and lilac color cardstocks before attaching it to the white blank card. 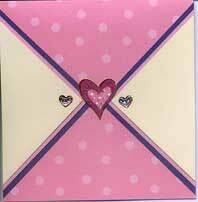 Three heart stickers used to embellished this pink polka dots card. 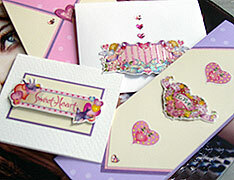 The cards in the pictures are done by using hearts' and angels' stickers, sticking them on blank card stocks. I love the colorful glittering stickers and find that all I need is to find some good quality cardstocks to bring out the beauty of these stickers. 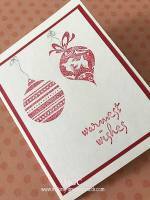 I also stick some on card scraps and cut them out, trimming closely to the stickers, then use double-sided tape to paste them on the card blanks. This gives the image a 3D effect. 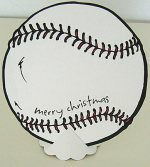 I love to use one or two to decorate my envelopes too.